Filled with over 40 pages of colorful pictures and illustrations, there are diagrams for all folding levels that anyone can follow easily. From simple and intermediate models, to modulars and complex crease patterns, there is something for everyone! Subscribe now! - Special Introductory prices are only good for a limited time! The reduced prices are for new subscribers of the domestic and international paper edition as well as the digital version of the magazine. POP (Plus Origami Paper) is also discounted only for the first 250 subscribers. (click read more to find out more about this cool origami paper option) You can check out our low discounted prices by clicking on the subscribe tab above! 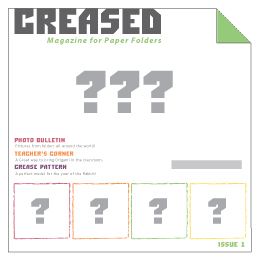 NEWS - World Renown Creators as well as new undiscovered creative talents get into Creased! Our call for submissions of new unpublished origami designs was enthusiastically answered from all around the world. Some of our contributors for the first few issues include: Lorne Dannenbaum, Bruno Ferraz, Seth Friedman, Gay Merrill Gross, Michel Grand, Talo Kawasaki, Laura Kruskal, Michael G. LaFosse, Robert Lang, In Kyung Lee (Whitepaper), Jae Gu Lee, Francis Ow, Chris Palmer, Elsje van der Ploeg, Won Seon Seo (Redpaper), Sok Song, and Paula Versnick!